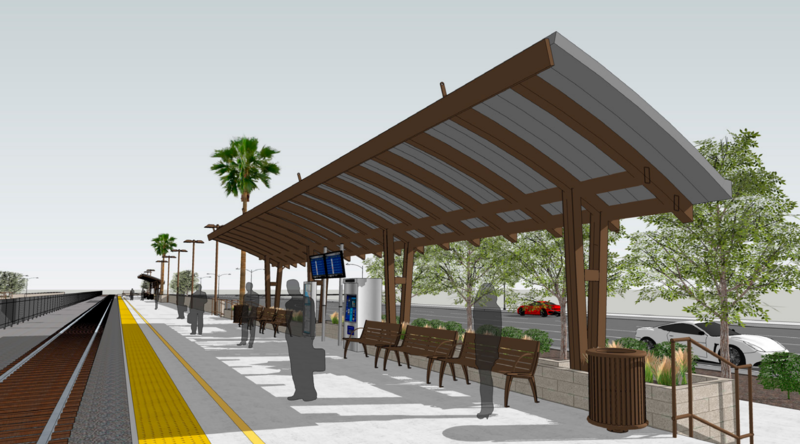 Construction of the Burbank Airport-North Metrolink Station will begin on March 21 at the northwest corner of Hollywood Way and San Fernando Boulevard in Burbank. The $15-million project is expected to be completed in the spring of 2018. Metro contributed $12.3 million of the project funds, and the Burbank-Glendale-Pasadena Airport Authority contributed $2.7 million. The Burbank Airport-North Metrolink Station will be on Metrolink’s Antelope Valley Line and will be located between the Sun Valley and Downtown Burbank stations. The Hollywood Burbank Airport is already served by a station on Metrolink’s Ventura County Line. Both lines also serve Los Angeles Union Station — the region’s busiest transit hub — and will make it easier to travel between downtown Los Angeles and Burbank Airport. Would be real nice if they could make that airport as major and international as LAX….. Yes! A new Metrolink station serving Hollywood-Burbank Airport. Is the “proposed mixed-use development” the “Aria” project? If so, the California High-Speed Rail Authority has designs on that exact same parcel, with the city letting the state and developers fight it out. Okay, I’m not trying to sound like I’m against this project, but make it easier how exactly?? There’s already peak-hour service between the Airport and LAUS. The only “easy” thing I see on here is that they’ll finally be a half-baked weekend service to the airport from LAUS and the Antelope Valley, that’s it. I’m maybe overlooking into this, but I feel like this station is being promoted to fulfill a promise, but not promises. Oh well, anything until the NoHo-Pasadena BRT gets built, which probably won’t serve this art of Burbank to begin with. My notes say that building started 2012 with anticipated completion 2015. What went wrong?